Here is a little 3-inch square card I made using Sweet Spring and some Easter Key Ingredients. The cardstock I used to make the card, favor box & liquid pearls are not in the key ingredients, but can be found in the Taylored Expressions store. Since the favor box comes with a window already die cut, I used a piece of vellum cardstock I stamped with the 'you're egg-stra special' sentiment so you can have a little peek of the goodies inside. Ta-Da! 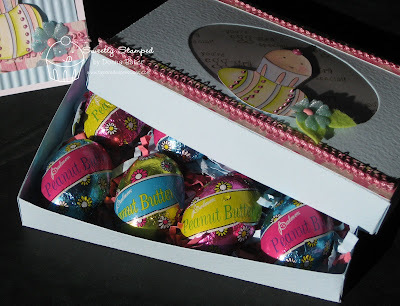 Here are the treats inside - peanut butter/chocolate eggs nestled on some coordinating paper shreds! 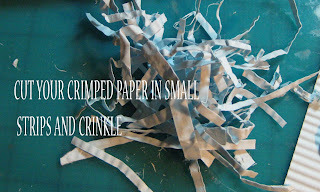 Here's a tip on how you can create your own paper shreds to match your project if you don't have any like I didn't! Hope you have an 'Egg-stra Special day & enjoyed my 'sweet' project. So so cute, Donna! I LOVE the box with the eggs! OH of course your special treat creation is amazing!!!! So sparkly and sweet!!!! 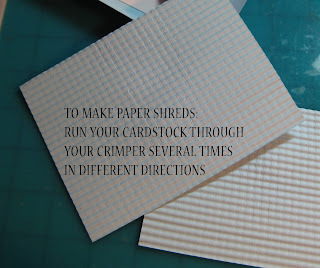 I love seeing how you made the crimped strips too!! Thanks!! This is just way to cool. Thanks for the inspiration. Donna, this is so sweet!